Bollywood Bakery is Now Open! We're taking orders for regular, eggless, vegan, and gluten-free cakes for all occasions. Please call for details. 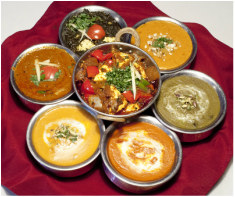 Bollywood Masala is family-owned, and has served flavorful lunch and dinner items since 2008. The menu is largely gluten free, with wine and beer available. New dishes and combinations keep your taste buds dancing. Open Tuesday through Sunday — dine with us today!